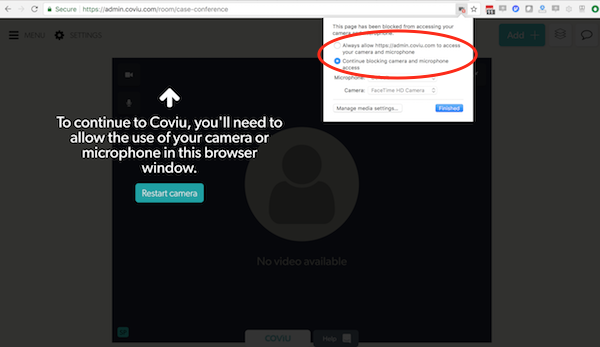 When you first enter a Coviu room, a security protocol is being executed by the Web browser that checks if you allow Coviu access to the camera and microphone. This happens because the browsers don't trust any site to behave correctly, so they initially block these devices. 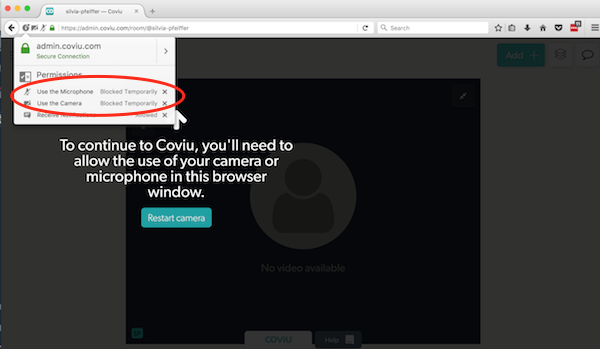 Coviu is helpful in pointing out that you need to hit the "allow" button to enable Coviu to work. The above image shows what that looks like in Google Chrome - it looks differently in Firefox and other browsers. This is, incidentally, also what happens if your computer or device has neither audio or video (it's increasingly rare, but it still happens). 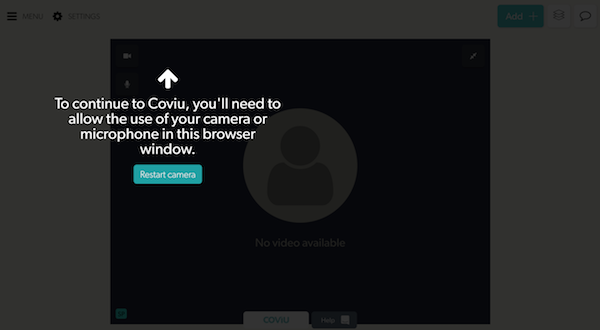 In order to use Coviu, you will have to allow access to the camera and microphone again. You do this via the camera symbol in the browser's URL bar. It's on the right in Google Chrome and the left in Firefox. 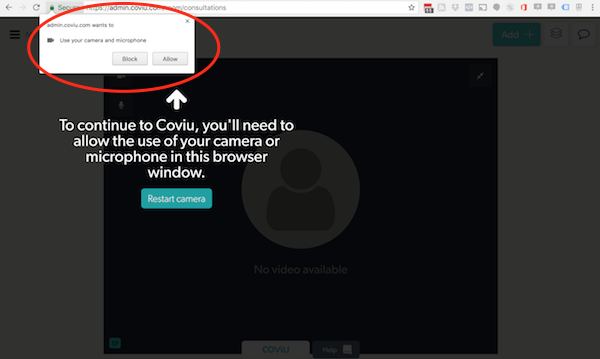 You need to click "Alway allow coviu to access your camera and microphone", hit "Finished" and then reload the page. In Firefox you need to click the little "x" markers next to "Blocked Temporarily" and then reload the page. After this, you will be able to use Coviu again. If your computer does not have a camera or microphone, you will not be able to properly participate in a meeting. However, for the occasional situation where that may be necessary, we have provided a manual fix: add "?no-media=true" to the end of the Coviu room URL and you will be able to enter. This is not a good way to participate in a call, so we don't recommend using this flag. We have, however, seen it useful occasionally, so here it is. If you think this should be a standard functionality of Coviu, message us so we can discuss your use case.